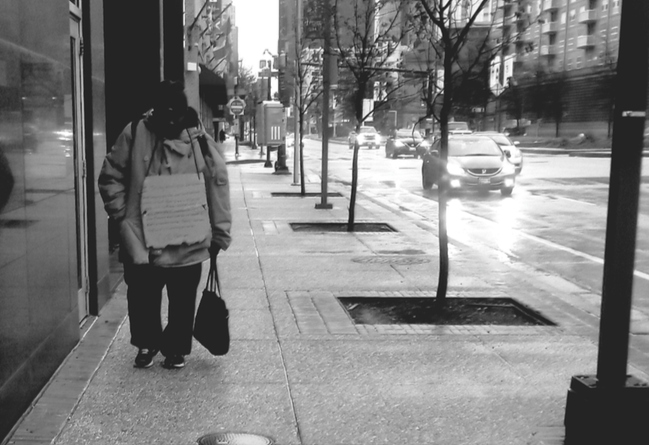 Homelessness is an issue that is often swept under the rug. It is Baltimore’s worst kept secret. I will even go beyond, to say that it America’s worst kept secret. It has become disgusting how we, as a society, disregard the homeless as if they are less human. The truth is that any of us could become homeless at any moment. One can hardly keep up with bills when living pay check to pay check. Having dead end jobs is a recipe for disaster especially when you have more than one mouth to feed. According to the Baltimore Sun there are 38 affordable housing units available to every 100 impoverished families. 150,000 eviction notices are filed every year and chances for finding low income housing are getting slimmer and slimmer while 2,928 shelter beds are available to fewer than 15,000 homeless Baltimoreans. This means more than half of the homeless population is forced to be out on the street with no access to bedding, showers, or food. Even when the homeless are able to reach a shelter charges must be paid, belong- ings could be stolen, and the overall experience is an uncomfortable one. Speaking with various Baltimor- eans who are homeless, I learned a few things. In 2015, during the unrest in Bal- timore, I met a young male by the name of Marco. I was on my way to take pictures of the torched Rite Aid in my neighborhood when I saw Marco being carried out by the police. He was crying so loudly that it made me cringe. Once the police let him go I pulled him to the side to talk with him. He was being arrested because he had went in to the burnt down Rite Aid to retrieve food items. He only made out with a bag of Sour Patch Kids. He began to tell me his story of being homeless and how he got here. At first, he was very brief as I expected because he didn’t know me, but as I started to see him more he began revealing more of himself. Marco was in his early 20’s and from Florida. He came up here after getting into trouble and found him- self without a home and employment. He informed me that the shelter he frequented charged three dollars a night. I wondered what kind of shelter would charge someone who had no money. Every time I saw him I gave him money, or anything helpful. That included phone calls to his mother, who had become sick. I started seeing him more often in my neighborhood and I knew his situation was worsening. Most of the homeless people in my neighborhood suffer from drug addiction or mental illness. Days, weeks, and months went by and Marco started to look worse than when we first met. That is when I learned he started to use drugs and getting into more trouble. One day, Marco had been stabbed where he was temporarily staying. I told him to stay away, but he couldn’t resist. After a while, Marco vanished. This may be the story for many others, but how would we ever know. The city does a horrible job of keeping up with the homeless population. Just because they are impoverished does not mean they do not deserve to have good health, food, clothes on their back and a safe place to stay. I will take time to give credit to the organizations who do their best to help the homeless and the people who volunteer their time with them. At the end of the day we are all human. What’s inhumane is Baltimore’s horrible excuse for evicting the homeless from the only place they have to stay. From MLK to I-83 encampments are being cleared. Under the bridge on MLK is a fenced area where tents once occupied. The homeless still can be seen walking up and down the boulevard. Officials have offered a shelter program, but how long will it last before they’re abandoned again? This shelter will provide beds for up to 40 homeless men and women. If there is going to be a shelter program, then it needs to be a big enough program that more than half of the homeless population can benefit. There needs to be help for those who suffer from mental health issues because throwing them on the streets is a danger to their safety. We have a long way to go and we won’t get too far with this issue unless we realize that it is an issue and stop trying to hide it for the sake of tourists. Baltimore, I am definitely judging you. As I was praying for a young, homeless woman I met a few weeks ago downtown, I started thinking about Marco. I decided to google him to see what happened to him, but I came across your post. I met him a few years ago when he was newly homeless. He was just a kid. Over time, I noticed how the streets really affected him. When I saw him pushing a homeless guy in a wheelchair around, I figured he started using. My parents had a shelter in downtown, and I recommended him to go there. My dad was going to give him special accommodations, but he never went. It makes me sad.